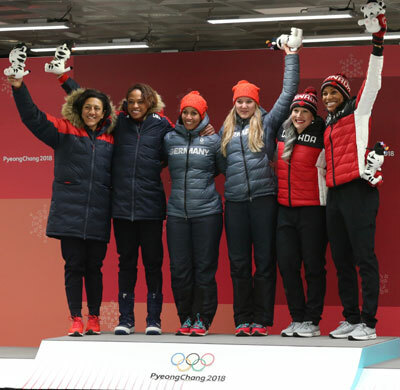 Daughters of Africa Sweep in Pyeong Chang 2018 — Leave it to the Women to pull off the first “sweep” in the Winter Olympics. All three medalist teams in the 2 women Bobsled in PyeongChang2018 Winter Olympic Games contain a daughter of African Ancestry for the first time in the Winter Olympic history. There are no snow banks high enough to keep the descents of Africa out. The Winter Olympic Games have long been set for snowy nations. The amazing challenge from Africa’s Diaspora Athletes is present now and clear to enjoy for the next Winter Games set for Bejing2022. The 2 Women Bobsled Medalist Teams were made up of Lauren Gibbs and Elana Meyers Taylor, one of the Americans silver medalist pictured on left. The Gold Medalist, Mariama Jamanka of the German Team in the middle, was born to a Gambian father, attended the Technical University in Berlin, Germany and is in the Armed Forces in Germany. Phylicia George, of the Bronze Medalist Team Canada, is studying Biology and physiology at the University of Connecticut, has competed in the Olympic 2012 and 2016 Summer Olympic Games, is on your far right. A point of note the Nigeria Team trailed the Jamaica Team in this event, so some experience does count. And yes, the race was very close at the top with point zero seven seconds between the American and German Team. For those of you keeping score, this time the Nigerian Team finished seven minutes and fifteen seconds behind the Gold medalist Team and the Jamaica Team beat Team Nigeria. So much for inter country rivalry.